*All discounted pricing requires bundle with qualifying American package. Alpha ETC Pack – $10/mo. PRIMARY PUNJABI LANGUAGE TV PACKAGES. *BASE DISH PROGRAMMING PACKAGE REQUIRED. 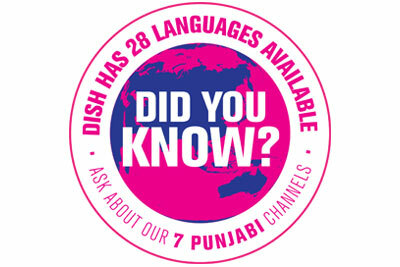 Look no further than the DISH Punjabi Mega Pack if you’re searching for the most comprehensive collection of Punjabi-language channels available. Programs include top dramas, movies, live interactive talk shows, children’s shows, musicals, cultural programs, and more! To order the Punjabi: Mega Package, contact your friendly DISH representative today. Punjabi: JUS Pack – $14.99/mo. DISH Punjabi JUS Pack is the perfect Punjabi tv package if you are looking for JUS One, JUS Punjabi or the JUS 24/7 Comedy Channels. To order the Punjabi: JUS Package, contact your friendly DISH representative today. PUNJABI CHANNEL ADD-ON PACKS. *INTERNATIONAL BASE AND PRIMARY INTERNATIONAL CHANNEL PACKAGE REQUIRED. Punjabi: Alpha ETC – $10/mo. Alpha ETC Punjabi, broadcasted 24 hours a day from Noida, India, brings you Punjabi-language programming that includes emotional dramas, cultural and religious programs, music, movies, news, and more. To order the Punjabi: Alpha ETC Pack, contact your friendly DISH representative today.